Well, we survived the tornado, but not the disaster. Cecil Cooper lost two games for us this week, and he should have to answer for it. 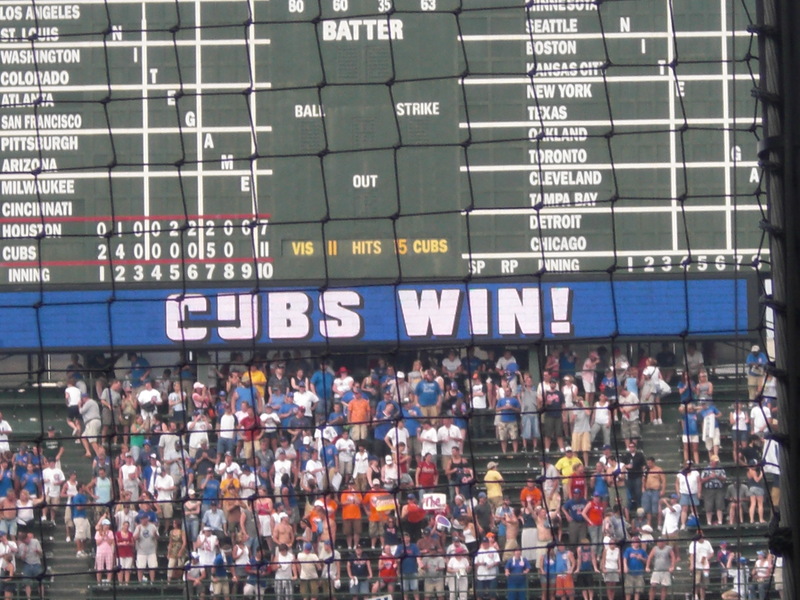 Wandy gave up six, and the Cubs surged to an early lead after two innings played. However, the momentum began to shift to the Astros’ favor later in the game. We scored two in the fifth, two in the sixth, and three in the seventh to jump to a one run lead. Then, the bottom of the seventh. Sampson was on the mound after pitching an effective but shaky sixth inning. He started off the seventh by giving up back to back hits followed by a sac fly from Fukudome. With the eighth spot due up, Lou Piniella sent in Daryle Ward to pinch hit. And then, with runners on the corners and one out in the seventh, Cecil Cooper made the call to have Sampson INTENTIONALLY WALK DARLYE WARD. I’m sorry, WHY? Daryle Ward is a career .264 hitter, and this season he’s only hitting .227. He’s only 1-for-4 against Sampson with two strikeouts, and he’s never faced Wesley Wright. In fact, I can’t believe Cooper didn’t salivate at the idea of getting the lefty-lefty matchup there. Why not bring in Wright to face Ward and force Pinella to manage his way out of it? We did have it right, and Cecil Cooper had it all wrong. It would not be his first mistake. Fontenot (lefty) had been announced to pinch hit for the pitcher, Howry, but Coop went to the bullpen again. Wesley Wright came in for the Astros, so Pinella burned Fontenot and turned to Geovany Soto (righty) for a better matchup. This makes it bases loaded, one out in the bottom of the seventh, Astros 7, Cubs 6, Geovany Soto v. Wesley Wright. The count went 1-0, 1-1, 2-1, 2-2… Strikeout! Now it’s bases loaded, TWO outs! TWO OUTS! “Maybe things will turn out OK after all. Go ‘Stros!” we’re thinking. We temporarily forgot that coming to the plate was… Alfonso Soriano. Well, Wright is DEALING, so bring it on, Soriano! MISTAKE NUMBER 2, COOPER, SIR. We fans in the stands were deflated. Weren’t you? I’m sure I don’t have to remind you of what happened next: grand slam, left field. Grand slam on a 1-2 count! Brocail would give up another run that inning, and we would not be able to come back. Eleven, eleven, eleven, 11 runs Cubs, 7 runs, Astros. I have yet to hear any explanation for walking Daryle Ward. Brandon Backe, EIGHT earned runs in the third. No one up in the bull pen. Two earned runs in the fourth. Who is that, Byrdak out there? Eleven, eleven, eleven, 11 runs Cubs, 4 runs, Astros. What made this loss really hard to take was the fact that once out there, Brydak threw 2 2/3 scoreless, and LaTroy Hawkins, who pitched the eighth (to boos from the Cubs audience) STRUCK OUT THE SIDE! I’ll call this a WAY #2 loss: bad starting pitching. But in my mind this game, like the one before it, was lost by Cecil Cooper.